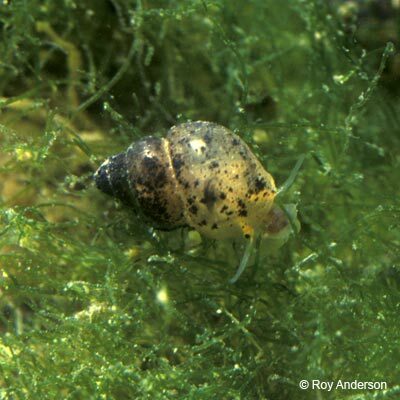 A hydobiid mud snail, small, operculate but relatively low-spired, with a large body whorl compared to other species. Shell fragile, translucent yellow-white but often coated with dark deposits and animal entirely pale. Rare, usually in the upper part of the tidal range in estuaries and in fresher water than Assiminea. Ranges along coasts from southern and western Ireland and south-eastern Britain to the western Mediterranean. Distribution type Suboceanic Southern Temperate (82). The correct name for this taxon is by no means certain. There is little doubt that Mercuria confusa (Frauenfeld) is closely related to Mercuria similis (Draparnaud 1805), a common Mediterranean freshwater species. Giusti (1979) and Giusti et al. (1995) argue that the numerous ‘species’ of Mercuria claimed for Mediterranean habitats are at best geographical subspecies, at worst merely demes, of one variable taxon. 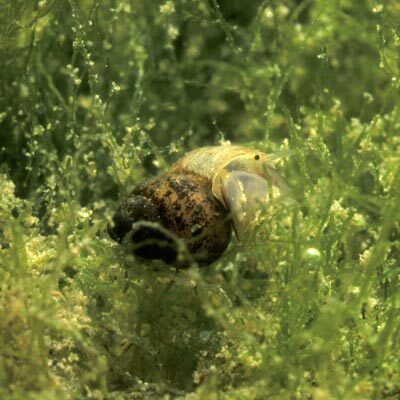 Their inference extends to the Atlantic/west Mediterranean form confusa which may well turn out to be synonymous with similis and consequently to have a Mediterranean-Atlantic distribution like the hydrobiids Hydrobia acuta and Ventrosia ventrosa. If the Atlantic and Mediterranean forms are synonymous then similis (Draparnaud 1805) has page priority over anatina (a name applied to British populations by Bank et al. (2007)) in Draparnaud’s monograph. Anderson, R., (2016). Mercuria cf. similis (Draparnaud 1805). [In] MolluscIreland.